WEEK 5: Drum Roll Please - Little Tyke Arrives in 35 Weeks ! This is the week where you’ve probably confirmed that you’re pregnant probably because you’ve missed your period and have taken a home pregnancy test. Furthermore, a surge in hormone levels may result in symptoms that may be too hard to ignore such as nausea, sore breasts and fatigue. There’s a lot that goes into the baby development process such as all the minor and major bodily systems and organs are starting to be formed from the ground up. And week 5 is when the ball is rolling! The circulatory or blood system is the first one to become operational along with its dear friend—heart, which you may even be able to see beating in an early ultrasound. Also in the making in week 5 of pregnancy are several other organs such as your baby’s brain and spinal cord. The pregnancy symptoms you will experience in week 5 are just a starting point of several different changes your body will witness. Most moms claim that the first trimester is the toughest of all, so on a brighter note, you just getting the tough stuff out of the way. But the last thing to want to do is get worked out about things, and stay focused on what you should be concentrating on i.e. to keep yourself healthy. popular to contrary belief and a little misleading, nausea can happen at any time of day and not just the mornings. Nausea can happen pretty much all day, and is much more severe if you’re pregnant with twins. Considering the fact that the morning sickness remedies that work for you may not for others, you should try a few different strategies to see what suits you best. Some of the best ones are eating small and frequent meals, eating special nausea-reducing lozenges or lollipops, vitamin B6, ginger capsules, and wearing acupuncture wristbands. This is one of those symptoms that you will experience in probably every single week of pregnancy, sometimes less severe than others. You may find yourself wanting to take a catnap in the middle of the day, which is perfectly normal. This is mostly because your body is generating more nutrients in order to support your baby. Remedies for pregnancy fatigue include eating every few hours and light exercise. If you experience cramps, it’s good news because it mostly means that your embryo has implanted well into the lining of your uterus. However, if you’re experiencing severe cramps, its best to speak to your OB to solve any underlying issues that may be present. You may feel the urge to urinate often, and that’s simply because your kidneys are expanding. This can seem a bit scary when your 5 weeks pregnant, but could also be caused by implantation. But if it’s less than spotting and more like bleeding, you should speak to your physician right away. It is also possible that, even at 5 weeks you may not experience any of the above mentioned symptoms at all or they may come and go. But just because you aren’t feeling sick, does not indicate that there’s something wrong with your pregnancy. Your belly for the most part in 5th week will look unchanged. However, you may feel a bit bloated at times or put on a pound or two. These scenarios will vary across women, but what’s important to know is that they are perfectly okay and normal. Most women in their week 5 of pregnancy are curious to know about their pregnancy weight gain and the best solutions to keep it in check. But there is no one size fits all solution, and doctors in fact recommended that you put on a few extra pounds somewhere in the ball park of 1 – 5 in the first trimester. If your BMI is under 18.5 meaning underweight, your total pregnancy weight gain should be approximately between 28 and 40lbs. If your BMI is between 18.5 and 24.9, your total pregnancy weight gain should be between 25 and 35lbs, 115 to 25bs if you’re overweight (BMI of 25 to 29.9) and 11 to 20lbs if you’re obese (BMI of 30 and above). 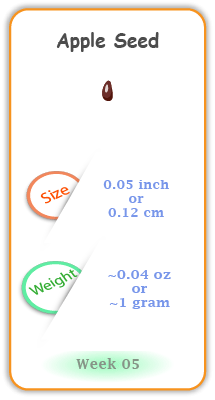 And if you’re 5 weeks pregnant with twins, your total weight gain should be between 37 and 54lbs. 5 weeks pregnant is the perfect time to get a little pampering from your partner, so go right ahead and ask for a massage because you deserve all the TLC (Tender, Loving, Care). 5th Week Pregnant Ultrasound - What to Expect ? Even though your baby (embryo) is growing at an accelerated pace, it looks similar to a tiny tadpole rather than a human. But its major organs such as stomach, heart, liver, kidneys and digestive and nervous systems have already begun to take flight. If you don’t have any risks or complications during your pregnancy, you likely will not have a 5 week ultrasound. Your OB may however have you schedule your first prenatal visit during week 8 or 9. But to paint the first draft of whats cooking inside, your baby in week 5 of pregnancy consists of three layers—ectoderm, the mesoderm, and the endoderm, which collectively and gradually form all its organs and tissues. 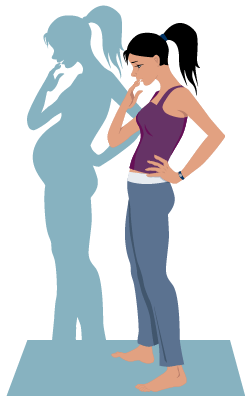 As mentioned earlier, your baby in week 5 of pregnancy is still just an embryo, but one that’s growing rapidly. Your baby at this stage is starting to form a C shape somewhat similar to elbow macaroni. What’s interesting is the fact that your baby has already formed its heart, a tiny one of course that’s just starting to beat, but these contractions will only become regular in the next few weeks. You baby at this phase is made up of an astounding 125,000 cells, and to put that number in perspective, that’s just enough to fill every seat in two large baseball stadiums (Dodger and Yankee both). To explain briefly, the top layer aka the ectoderm is basically from where your baby’s nerves, spinal cord and brain will emerge. It is also the layer that will assist in developing hair, skin, nails, tooth enamel, mammary and sweat glands. The middle layer or the mesoderm is where the heart and circulatory begins their inception, and will also form its bone, cartilage, muscles and subcutaneous (under the skin) tissue. The endoderm is the last layer of the three, and will accommodate the intestines, lungs, urinary system, liver and pancreas.